When two global innovation-focused organizations convene for one day, something big is bound to happen. 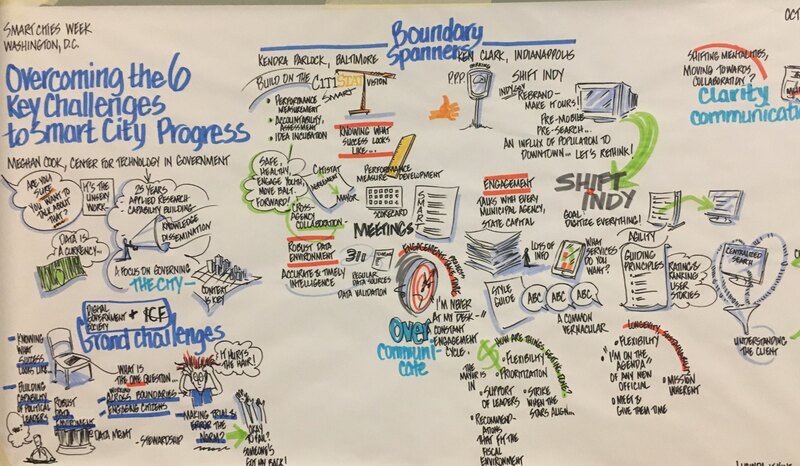 The Intelligent Community Forum (ICF) and the Digital Government Society (DGS) came together to foster research and practice partnerships focused on advancing innovation in both rural and urban settings throughout the world. 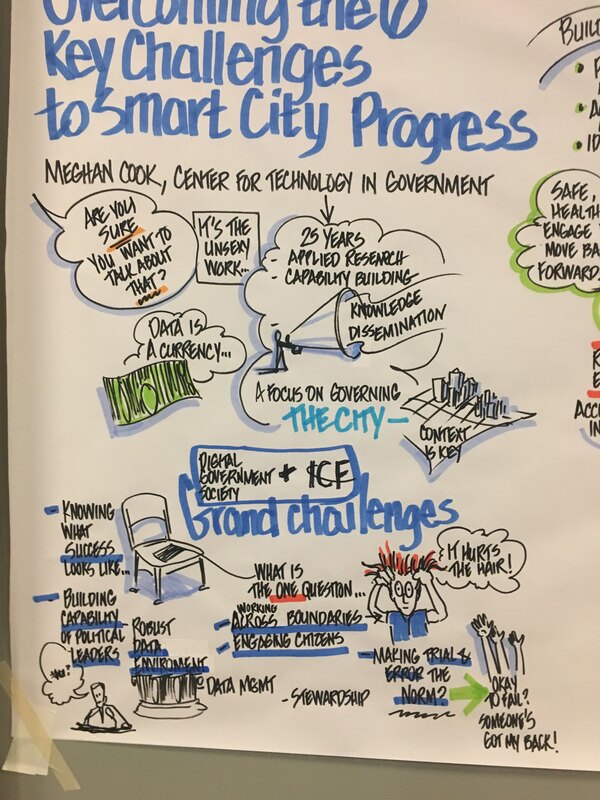 Over 400 city government leaders and academic scholars kick-started the joint event with a “grand challenge” discussion to identify real challenges facing cities and communities, both big and small. This cross-sector workshop-style exchange produced a list of challenges that leaders face every day in realizing long-term visions. Innovation in the digital age requires sustained, long-term engagement with a range of stakeholders in many sectors. In order to achieve a leader’s vision, they must have support from public, nonprofit, and private stakeholders and this requires the ability to work across multiple boundaries, towards the same goal. Boundaries can span departments, organizations, governments, and sectors, and, in each case, context can be different. Leaders must combine missions and align resources while moving towards a common goal. The skills needed to lead these efforts are typically honed over the course of many years. Even then it still be challenging. Leaders that create the human, policy, and organizational conditions necessary to work across boundaries are the ones that realize the rewards. Cities and communities that see their data as their most critical asset usually pay careful attention to the collection, management, cost, use, value, and protection of that data. A robust data environment is not always the norm and even when there is a dedicated team, it certainly does not happen overnight. It requires an empowered team with a range of skills, capabilities, and resources to identify how data can help make a real impact and then the authority to put all the necessary processes and infrastructure in place. Creating this type of environment is challenging for all communities, not just small ones. Dedicating resources to data is not always seen as the top investment. But for those that have been able to secure an organization’s investment in building a data-focused environment, there are endless stories of how it has informed decision making and the goals were finally achieved. Cities and communities know that citizen engagement can improve public services and provide greater transparency and accountability. However, few know when it is appropriate and how and when to actually do it. Figuring out what, when, the medium, the frequency, and the process for incorporating public input into policies and decisions are skills that typically fall outside of many core capabilities. Unless a city can dedicate a leader, most are left to navigate this space alone. The good news is that there are a number of experts and resources available. Some city leaders see larger metropolitan areas staking claim to big wins and they want the same. But success is different based on the context of each community. Success comes down to how it is defined for the specific needs of city. Sometimes city leaders will take projects identified by other cities and use them as their own. This does not always turn out for the best. Leaders that consistently bring together a range of stakeholders to identify and agree on what success means to them, specifically for their community, are far more likely to achieve it. Those leaders recognize that it takes a combined and concerted effort from all stakeholders to reach a vision. Getting all community leaders to agree on what success means to them, even if it is different or contrary to other cities, is the first step in advancing growth. Leaders in public and private sectors are told they must create an environment where individuals can engage in trial and error and, in some cases, fail when innovating. Innovating is difficult, as it requires lifting parameters around thinking, but communities that create the conditions for innovation are the ones that find real value. While political leaders are the face of their communities and are working to secure resources, they are not always equipped with the necessary knowledge, skills and capabilities to engage in all discussions. Political leaders must have more than just an awareness of what it takes to make a community more intelligent. They need to understand how the technical, organizational, policy, legal and economic factors weave together in an overall strategy. Some political leaders claim that they do not need to have this understanding because they have teams for this work, but there is an emerging shift in thinking that suggests the leaders need to have a certain level of expertise, even if someone else does the work. There must be a constant knowledge transfer from resident experts to political leaders to build and solidify a collective understanding of the interconnections that lead to success. Traditionally, cities and communities rely on either capital investment plans or external grant funding to carry out innovation initiatives. These may have worked in the past, but in order to meet new challenges, new funding models need to be identified, tested and evaluated. Traditional methods are not suitable for the emerging needs and new public/private partnerships. Data monetization is an example of a funding model that is new to many communities and a careful analysis of the economic, stewardship, and policy implications are highly recommended. A more holistic and enterprise approach to analyzing the viability, impact, and implications of new funding models is needed. Each of these challenges is not overwhelming alone, but together, they represent barriers that community leaders face when trying to innovate. Research and practice leaders believe getting these areas right can set the foundation for achieving an intelligent community, but doing so requires a collaborative cross-sector and multi-disciplinary approach, something the DGS and ICF are well poised to lead.